Constructed to a very high standard using scandinavian softwood. Gates are constructed on Ex 70mm frame thickness using traditional joints mortice and tennon joints which are glued and fixed with hardwood dowels. 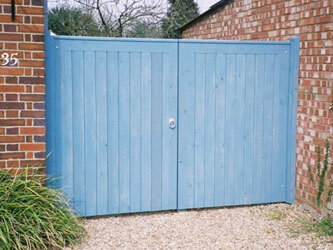 All gates are basecoat treated and are supplied with rebated closing stiles with right hand leaf opening inwards first unless otherwise stated. Matching side gates are available. Recommended Gate Post size is listed next to price. Framed gates vare available to suit automation (please enquire). Gates can be made to order, in between sizes are charged at the next size up. Prices are per pair to fit width stated.